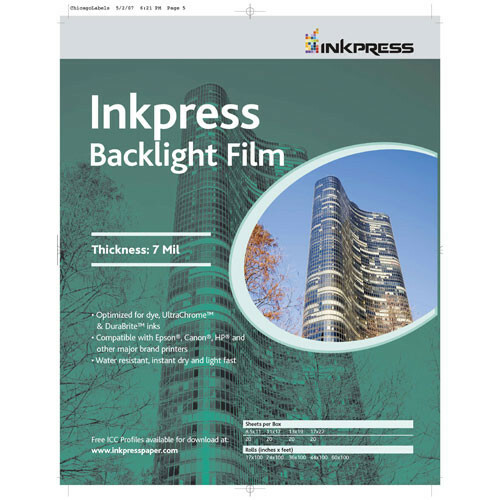 Create sharp reverse or direct prints with this 50-sheet pack of 8.5 x 11" translucent Backlight Film from Inkpress Media. Made from a polyester film with an ultra white diffusing layer, this film has a matte printing surface and a glossy reverse surface, which can be used in many specialized applications such as mirror-type printing or use in illuminated frames. Also, the 7 mil film is instant drying and water resistant in addition to being light fast. Box Dimensions (LxWxH) 11.3 x 8.85 x 0.65"
Backlight Film (8.5 x 11", 50 Sheets) is rated 3.0 out of 5 by 1. Rated 3 out of 5 by Willow the Whisp from Wish it was better Using this product on glass blocks to light photos. Nice transparancy. Surface is fragile but is improved with a good photo finishing product. Downside is photographs look dull without the light. can this paper be used in a color xerox machine C75?